Skydive and promote breast cancer awareness! To kick off the Breast Cancer Awareness Month of October, we are hosting a fundraising event with Skydive 4 Causes, Inc. on October 22, 28 and 29, 2017. 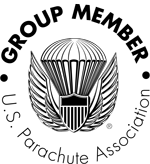 Cross skydiving off your bucket list while supporting a good cause! $65 from every tandem jump ticket will be donated in support of the American Cancer Society. Learn more about the American Cancer Society here! As a nationally registered 501(c)(3) nonprofit organization, Skydive 4 Causes, Inc.’s mission is to help new and experienced skydivers have their skydive mean more by having their jump support causes that are truly important for them. All donors will receive a tax deductible letter for their donations. Skydive Cross Keys is a world class skydiving center only 15 miles south of Philadelphia. Our experienced instructors have been taking first timers on tandem skydives for 24 years. You can see Philadelphia and Atlantic city on your canopy ride. We are spectator friendly, so bring friends and let's promote breast cancer awareness together. Event dates: October 22, 28 and 29, 2017. Prices: Tandem Skydive: $250, Tandem Skydive with Video: $380. $65 from every jump is donated for breast cancer research through Skydive 4 Causes, Inc.
BOOK YOUR SKYDIVE FOR A CAUSE! If you prefer to book over the phone, please call Skydive Cross Keys at 856 629 7553. See you in the sky! For any questions and inquiries, please contact the event organizers, Alix Bien-Aime and Dr. Nicole Hollingsworth at info@skydive4causes.org.